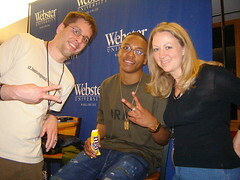 Lupe Fiasco (born Wasalu Muhammad Jaco) played a free show at Webster University last Friday. In my opinion, his Food & Liquor was the best album of 2006. In the picture on the right taken by Camille Peace, I'm playing rock, paper, scissors with Lupe (tie!) while Amanda stands by. We were backstage courtesy of VIP passes wrangled by big man on campus John Ginsburg (thanks, John!). John also got DJ Trackstar backstage and into Lupe's dressing room, where Lupe recorded some sound bites for Trackstar's next mixtape while Camille shared a fruit plate with the head of the FNF crew. Look for Trackstar's mix hosted by Lupe Fiasco to drop sometime in the next couple of weeks.